Great Gatsby! Who Made Your Dress?! Because I have infinite amounts of time and can spend all day every day doing exactly as I please, I’ve decided to join in the Great Gatsby Sewing Challenge hosted by Miss Crayola Creepy. In case you didn’t detect my sarcasm, I have zero time to do this. None. Zilch. Nada. But I’m sure going to try anyway! If you follow me on twitter, you know that I spent all weekend working on my Mom’s robe, and I’m still not finished. I grossly underestimated the amount of hand-stitching that is required to make this garment fit for royalty – because my Mom is most definitely royalty. She’s the most exquisite woman I’ve ever known. So, this week will be spent fell-stitching, slip-stitching, and catch-stitching. At some point I’ll have to make time to finish altering my Elisalex and hem it so I can wear it to a wedding on Saturday. Then of course there’s the Laurel sewing contest – I’m hoping to get that done on Sunday. That should be a pretty quick make. THEN and only then will I be able to switch gears and move back in time to the roaring 20s. I do realize that I am probably biting off more than an army could chew in the matter of hand-beading…my very first hand-beading experience no less. But, have you tried to squash moments of great inspiration? It’s practically impossible. Stephanie at Mabel Makes and I have decided that we should have a virtual speakeasy party to show off our new dresses! Anyone want to join us? Any ideas on exactly how that should work? Should we all agree on a date and each throw our own speakeasy party, then post the photos on our blogs? Anyway…that idea needs some work so please pitch in! Thank you! I hope so! I had intended on taking a break from complicated projects for a while, but when I saw your post about this challenge I absolutely couldn’t pass it up. I can’t wait to see your Gatsby dress either! Go for it. I’ll be cheering you all the way! Actually hand beading can’t be that difficult but I’m assuming quite therapeutic. Like all hand sewing. Good luck! I love your inspirations! I’m in the same boat, I love the great gatsby and am desperate to get involved but have zero time. In fact any time sewing is taking time away from revising which I really need to start, let alone do… at least we have till the end of May! I can’t wait to see your version. I hope you can find time to do this challenge too! I would love to see what you’d create – I know it would be gorgeous. o! Wonderful! I am still not so sure about joining this sewing challenge… May is a busy month at my work … Your idea is stunning! Go for it! Yeah, with every day that passes I realize how much of a project this is going to be and how I just don’t have the time to do it. But I’m going to try anyway. Thank you so much for the encouragement! Go for it! You could always do a really simple sheath dress out of a fantastically sequined fabric! Anthropolgie currently has one out called the Gatsby Paillettes Dress that would be easy peasy to reproduce. 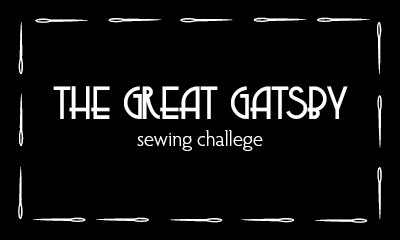 I was looking for inspiration for the Great Gatsby sew along too and really like the Sue Wong dress you posted. 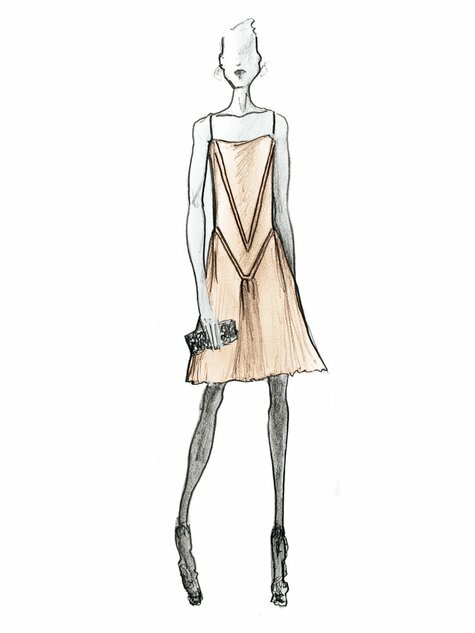 I notice a lot of dresses from that time have really deep v necks but you can combine them with contrast fabric and a piece that is straight across (like the sketch). They’re going great! I finished the robe I was working on for Mom AND my Elisalex (although I haven’t had time to photograph the Elisalex for a post.) I have two Laurel’s that are both half-way finished so I should finish them soon. This weekend I purchased fabric for my Gatsby dress – I stil need to get beading supplies though. I’ve been toying with whether or not I will give my dress a v-neck so thanks for that suggestion!